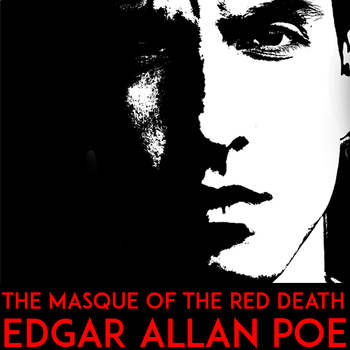 Looking for a rigorous, in-depth unit on Poe’s classic story? With bellringer freewrite prompts, questions for close reading, questions for discussion, and a Biblical and literary allusions research jigsaw activity, this mini unit will get your students discussing big ideas and engaging in a close reading of this challenging horror story. have lots of fun teaching this classic horror story! 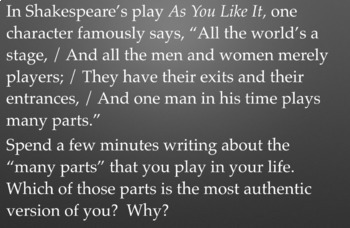 All of the answer keys quote the important passages, so there is no guessing on your part as to which parts of the text are most important. 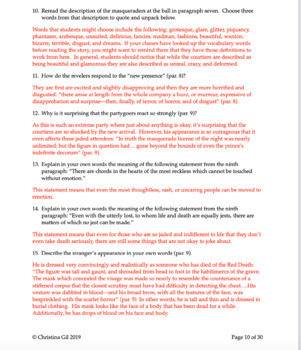 When you discuss the questions with your classes, you can point them to the sections to make sure that they are engaging with the text and working to interpret the sometimes challenging language. Read on for a more detailed description of what’s included in this resource. Vocabulary: Like many of Poe’s other works, the plot of this story is quite engaging for students; however, if they are unfamiliar with some of the key words, they’ll have a hard time understanding the more subtle nuances of the text. I suggest starting students off with the included vocab list so that they are more prepared. Bellringer Freewrites: I love starting every class with a quick five-minute freewrite. It’s a great way to get students focused and thinking about the themes of the day, and a calming routine that aids in classroom management. You might choose one of the prompts for the whole class to write on, or you might have students complete more than one freewrite in their notebook or a writing journal. These also make great choices for learning stations, interactive notebook activities, or pre-reading discussion. Close Reading of the Story: The questions that I have included are designed to get students reading carefully and noticing the artistry of this allusion and symbol-heavy story. I like to let students work with partners or in small groups, but you might prefer to have them work independently. 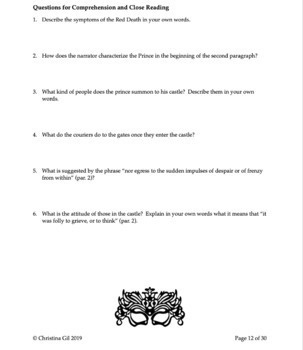 Discussion Questions: The discussion questions are designed to get students digging even deeper into some of the bigger themes and essential questions of the story. You might use all of the questions for a full-class discussion, select a few questions to discuss as a class or in small groups, or set up the questions in learning stations around the classroom. Biblical and Literary Allusions Research, Close Reading, and Jigsaw: There is a lot to research and explore in this story, so getting students to split up the workload is a fun idea. In small groups, they’ll research and analyze one allusion. Then, they’ll take their information to other students, sharing what they have learned as they fill out the jigsaw chart. Post-Reading Activities: Besides being fun choices for engaging different learning styles, the suggested post-reading activities are all nice ways to extend students’ understanding of the story. You might choose one activity for the whole class, set up the activities in learning stations, or let students choose their own adventure. There are no lectures or power points here—students will do the work themselves, with guidance from you. Rather than telling them what the story means, you will be empowering your classes with the confidence and skills to tackle challenging texts on their own.